The DANGER: A giant Mantis (as expected), released from arctic ice! Immune to your puny rifles and flamethrowers! Appearance is preceded by an omnipresent, droning, buzz! "In all the kingdom of the living, there is no more deadly or voracious creature than the Praying Mantis!" Kind of adorable looking when in flight, even at speeds over 200 miles per hour! Uses its immense, spurred forelegs to tear open all manner of human vehicles, and feast upon those within! The opening act bears some similarity to Howard Hawks' The Thing From Another World (1951), with ominous happenings at arctic government installations, if this were combined with an educational film about radar. Be thankful for RADAR(! ), as it is apparently keeping us all safe at all times. When our leading lady, Marge (Alix Talton) shows up to this particular radar base, it is revealed to be full of overbearing creeps, who whistle at and crowd her. And I don't care for Col. Parkman, who keeps shoving his bland man-face into hers. I much prefer the other male protagonist, Dr. Nedrick Jackson (William Hopper), Marge's smart, capable coworker at The Museum Of Natural History. He solves the mystery of what the monster actually is, but sadly takes a backseat in the final act. I remembered this film from an episode of Mystery Science Theater 3000, of which I only saw glimpses. I recall being somewhat impressed by the special effects, and I still feel that way, having now seen the film fully. 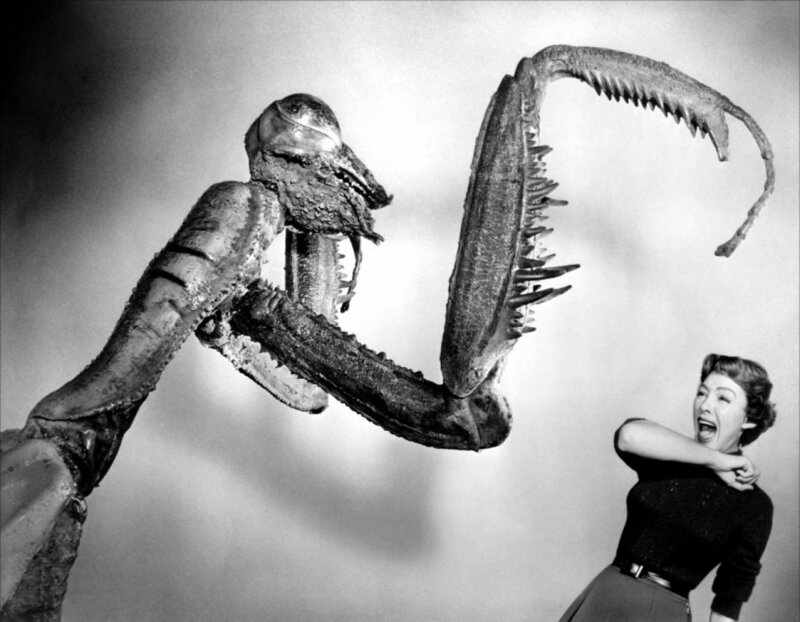 The creature is portrayed by a puppet, or puppets, fabricated in what I can only assume to be a large scale (a promo image of Talton next to a human sized mock up of the insect may confirm this). There is a model of the monster in flight, and a single shot of an actual mantis, shown climbing up the Washington Monument, a la Tarantula. The finale, inside Manhattan tunnel, is particularly effective, with its use of smoke, ravaged vehicles, and great, offbeat compositions. Come for the RADAR(! ), stay for the monster.